McDonald's announced that it is making Happy Meals menu in the United States healthier beginning in June 2018. Meal combinations offered on Happy Meal menu boards will be 600 calories or fewer, with 10% of those calories coming from added sugar and saturated fat. To reach these self-imposed nutritional requirements, McDonald's will only present the Hamburger Happy Meal on the menu. But a Cheeseburger Happy Meal can be ordered upon request. The portion of french fries will be reduced in the 6-piece Chicken McNugget meal by replacing the 'small' French fries with 'kids-size'd fries. 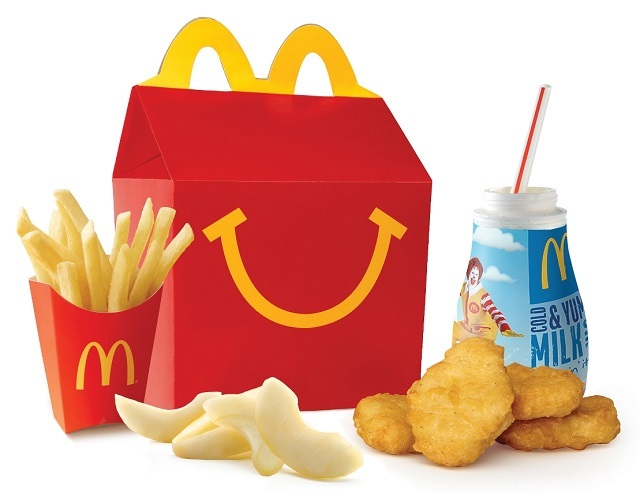 Chocolate milk will no longer be listed on the Happy Meal menu, but will still be available at a customer's request. The fast food giant said that it will also reformulate its chocolate milk to reduce the amount of added sugar. Later in 2018, bottled water will be added as a featured beverage choice on Happy Meal menu boards. McDonald's said that it will also simplify Happy Meal ingredients by removing artificial flavors, added colors from artificial sources, and reducing artificial preservatives where feasible. With these Happy Meal menu changes, there will be average reductions of 20 percent in calories, 50 percent in added sugars, 13 percent in saturated fat and/or 17 percent in sodium, depending on the customer's specific meal selection.